Even the introduction of England international Daniel Sturridge could not inspire the Reds, who now face a replay. 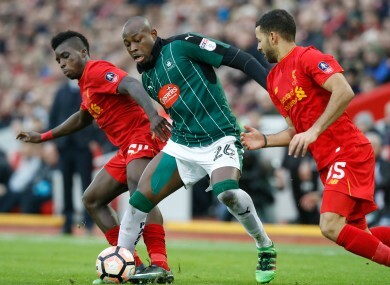 Liverpool's Sheyi Ojo (left) battles for the ball with Plymouth Argyle's Paul Arnold Garita (centre) during the Emirates FA Cup, Third Round match at Anfield. The sides met for the first time in any competition since April 1962 and although the Premier League team dominated possession and had the majority of the chances, they were unable to find the net. Plymouth, who are second in fourth-tier League Two, will now host the seven-time winners at Home Park in south-west England later this month. It will add to a congested January for Liverpool manager Jurgen Klopp, whose team also have a two-legged League Cup semi-final against Southampton to contend with. After a hectic festive period, Klopp decided to rest many of his first-choice players as he made 10 changes from the 2-2 draw at Sunderland in the Premier League. He ended up naming the youngest team in Liverpool’s history, with an average age of 21 years and 296 days, which included a first start for teenage striker Ben Woodburn. The 17-year-old became Liverpool’s youngster ever goalscorer in a League Cup victory over Leeds United in November. He drew the first save out of Plymouth goalkeeper Luke McCormick with a low toe-poke from close range after clever play by Emre Can. Divock Origi had the ball in the net for the Reds moments later after he brought down a high ball, but the Belgium international was deemed to have fouled Plymouth defender Gary Miller. Liverpool controlled the play against a side 68 places below them in the English football pyramid, but the visitors were organised and reached the break on level terms. Plymouth, backed by 8,500 vocal fans who had made a near 600-mile (965-kilometre) round trip to Merseyside, finally managed a shot on target 10 minutes into the second half. But Graham Carey’s speculative free-kick was comfortably saved by Loris Karius. Liverpool midfielder Lucas Leiva, handed the armband by Klopp, brought a save from McCormick with an equally audacious effort from outside the box moments later. Anfield started to grow restless and Klopp responded shortly after the hour mark with the introduction of Daniel Sturridge for Can. The striker’s first act was to whistle a low shot just the wrong side of the post following a Liverpool counter-attack. Shortly after he lifted a dangerous ball into the area, with Sheyi Ojo not quite able to apply the decisive touch. Klopp brought on Roberto Firmino and Adam Lallana with 15 minutes remaining in an attempt to inject some life into his side. Despite the fresh legs and six minutes of added time, the hosts failed to find a way past a stubborn Argyle defence. Right at the death, Trent Alexander-Arnold’s free-kick was flicked on by Origi and substitute Connor Smith almost nudged the ball into his own net, only for McCormick to gather. When referee Paul Tierney blew the final whistle, the Plymouth players went to applaud the away contingent, who celebrated as if they had secured victory, while Liverpool’s players trudged off. Email “Liverpool left frustrated as Plymouth park the bus to great effect”. Feedback on “Liverpool left frustrated as Plymouth park the bus to great effect”.